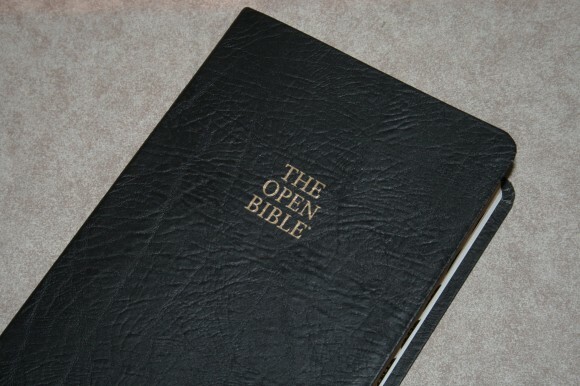 The Open Bible has sold over 2 million copies. 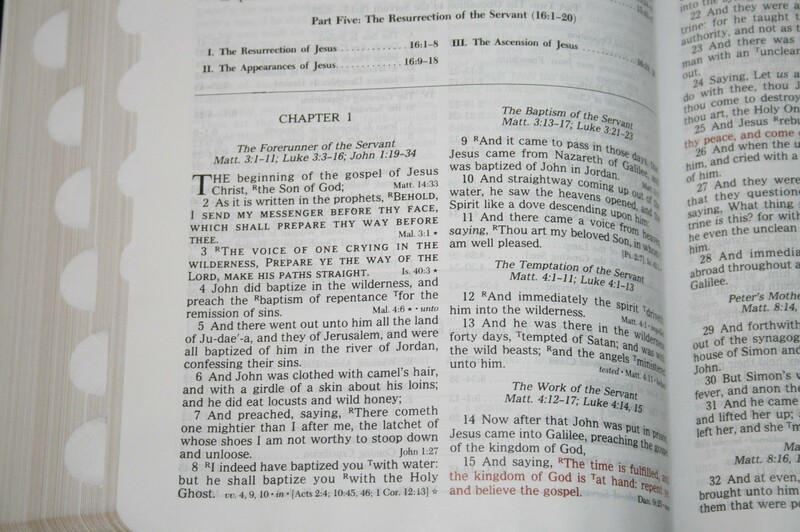 The KJV edition was out of print for a while, but now it’s back in Thomas Nelson’s Signature Series. 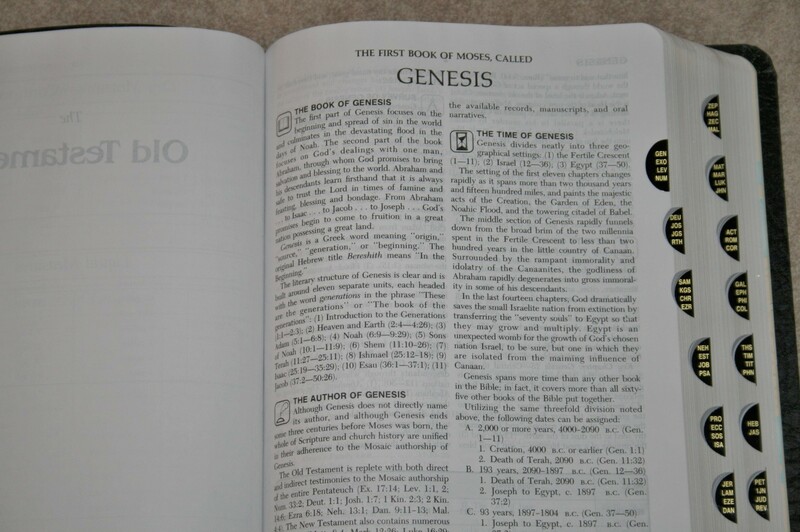 In this review I take a look at The Open Bible KJV in bonded leather with thumb-index. The cover is bonded leather with a vinyl paste down liner. It’s thin and feels a little too stiff. Not that it’s not flexible; it just doesn’t lay back down flat after I’ve had it open. It will lay open around page 30. It doesn’t lay as flat as I would like because the spine stays flat. This makes the text bend down into the margin a little. It’s not bad though because it does have a little bit of inner margin space. The text block looks glued, but I did find some stitching in the maps and it’s guaranteed for life. It doesn’t make sense to guarantee a glued binding for life. If it is sewn, I just wish it were more obvious. The paper is around 30gsm (just a guess though) and is opaque enough for me to not complain about it. The only thing I don’t like about it is it has a shine to it that’s noticeable with a reading light. I looks fine in normal lighting. The font is around 9/10. It has about a medium darkness and is fairly consistent throughout. The red letter is a medium red that also consistent. OT quotes are in all-caps. I like this because it makes them stand out. Other translations have them centered or set to poetic verse. In my opinion that looks better than all-caps, but all-caps is better than nothing. Section headings give parallel passages in both testaments. The column design is better than most due to the font size and column size ratio. There is more space between words than normal. Combine this with a nice leading and the text has more white-space, making it more readable. It never feels cramped. The words never feel like they’re too close together. It never feels like too much space either, so there’re no awkward gaps between words. There are 20 pages in the back for notes. It’s the same paper as the rest of the text. I’m glad they included this. I’d like to see more Bibles provide pages for your own notes. References and footnotes are end-of-verse. These means there are fewer of them, but it also means that the column of text is wider. References are conceptual – passages with a similar concept. Footnotes are equivalent translations that explain the word in the text. Stars are used to indicate prophecies. An empty star is where a prophecy is foretold and a filled-in star is where a prophecy is fulfilled. The book introductions are between 2 – 5 pages. They cover basic information about the book, the author, the date and setting, Christ in the book, key verses, a survey, a detailed outline, and a chart. The introductions are well written and have lots of good info that would help in study and sermon prep. Many pages have notes at the bottom. 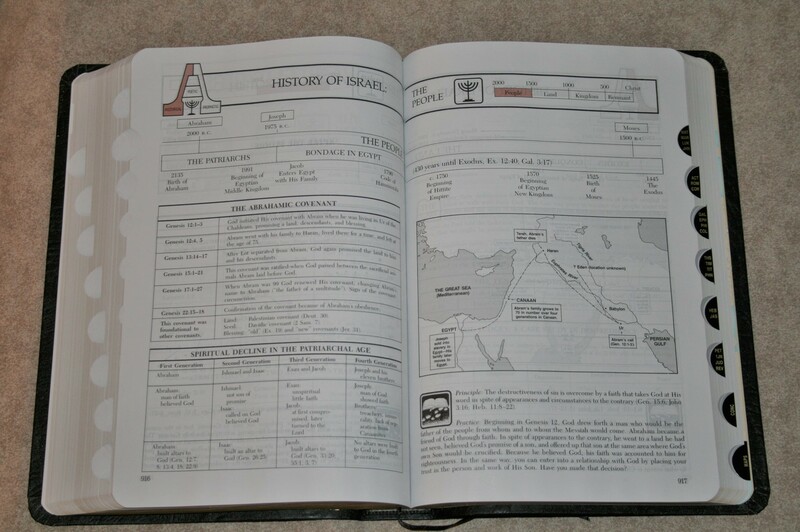 This is not the standard study Bible commentary that’s found in regular study Bibles. This is a Bible study from a passage on that page. The passage is underlined so you’ll know quickly that there’s a study on that passage. The notes discuss the topic and point you to the next verse in that study. This creates a chain study throughout the Bible. It’s described as an advanced course in systematic theology. Any course and commentary on theology will contain bias. I recommend that you be aware of it and do your own study as you’re going through the course. 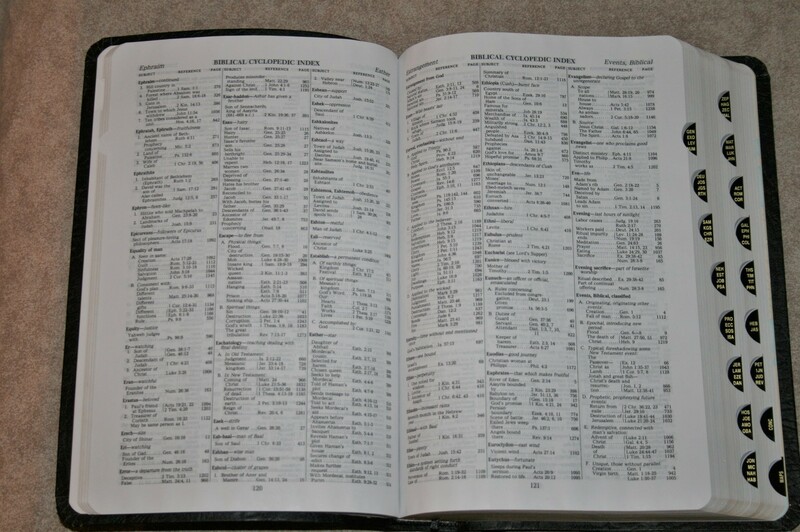 The index is 298 pages with three columns per page. 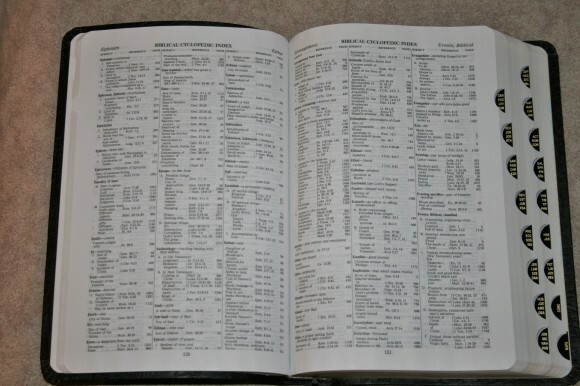 It includes 8000 names, subjects, places, things, concepts, events, and doctrines. 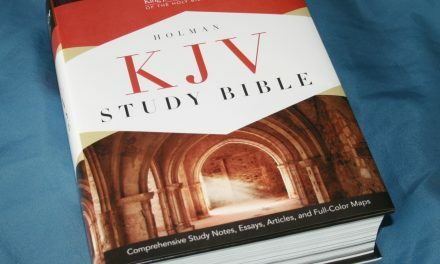 It’s extremely vast and helpful for personal study and sermon and class prep. Since it has doctrine and concepts it will have some bias. This is a very useful tool. 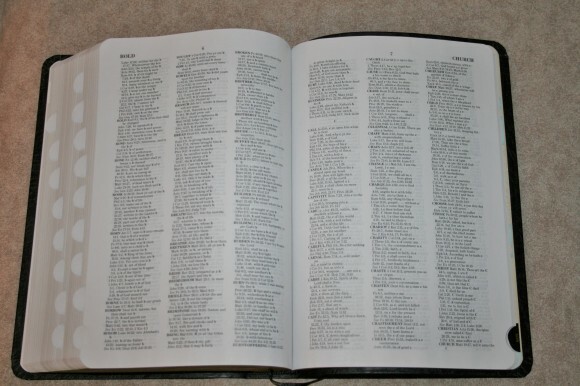 Each entry gives the verse and page number. Ark of the Covenant – a small box containing the tablets of the Law. This entry contains 42 topics and many of them have multiple verses. There’s enough material in this index to keep someone busy for a long time. With 8000 topics and lots of entries there’s a good chance it will have most of what you need for topical study. This helps make up for the fact that there aren’t very many cross references. Since it helps make that page cleaner and focus on the text, I prefer to have a topical index to cross references in the text. There are 8 full-color maps on heavy card-stock paper. There isn’t an index, but they are annotated and labeled well. 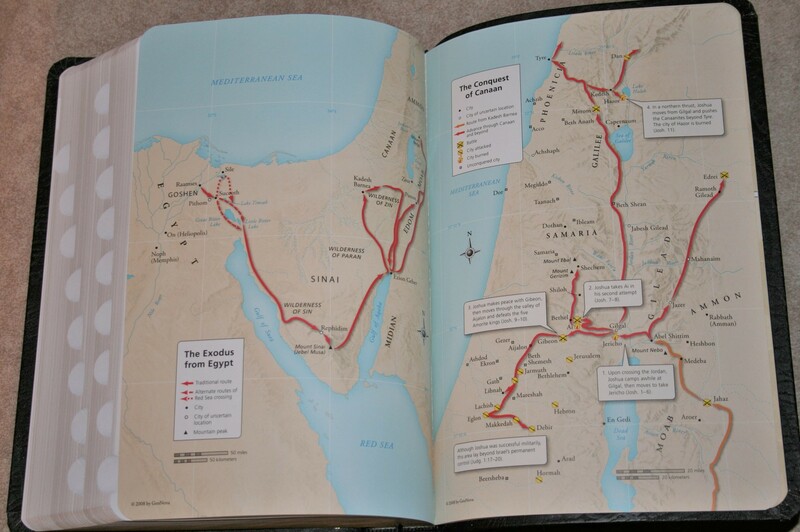 One thing that I find annoying is the route for the Red Sea, even though it’s labeled Red Sea crossing, goes through the Reed Sea instead of the Red Sea. This is wrong on every level and needlessly places doubt on God’s infallible Word. I’d like to see this changed. Other than that I like the look of the maps a lot. I decided to try the thumb-index version just so I could compare it to others. This is where Cambridge gets it right – they have a separate tab for all major books. Nelson has on average 4 books per tab. This means that Matthew, Mark, Luke, and John share a single tab. Most companies at least do 3 per tab (which is still almost useless in my opinion). For a thumb-index to be useful it should have one per major book and two for smaller books. 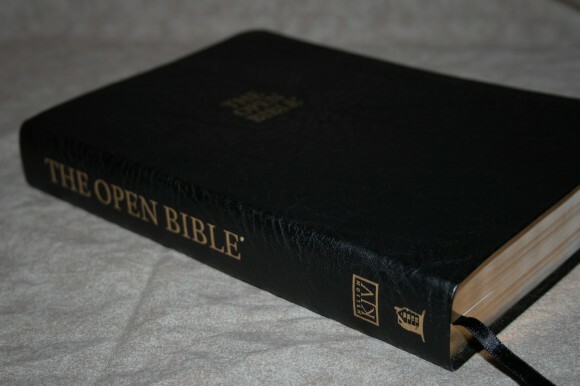 The strength of the Open Bible is its topical index. This alone makes it a good Bible for study and sermon prep. I’d like to see a better quality cover and paper that doesn’t shine under a light. I like the print quality and the study features. In my opinion, a good study Bible should give you the tools to do your own study – letting Scripture interpret Scripture. 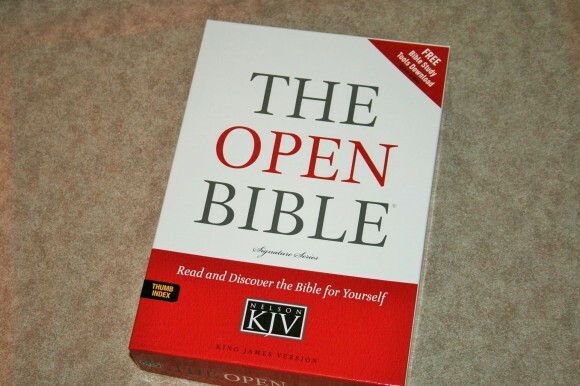 The Open Bible does have some commentary with bias, but it also has a lot of good quality tools to do your own study. 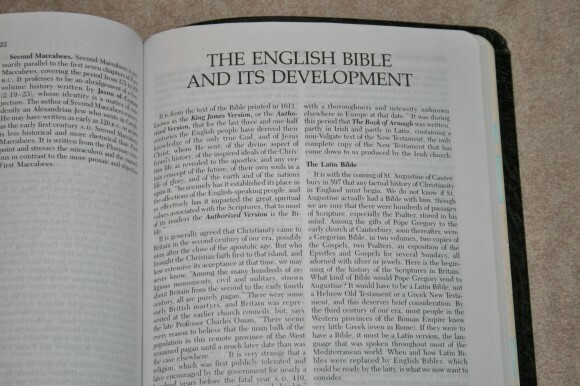 This bible has lots of nice features that many will find useful, but……… What has happened to all the wonderful high quality bibles that this publisher once produced? I had one that I gave to my son when he left home that would compare favorably with anything that has ever been published by anyone anywhere. 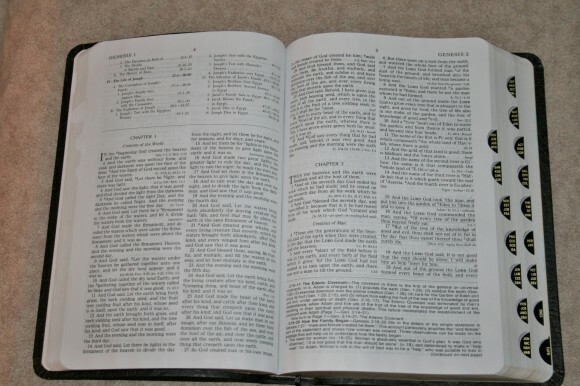 Surely there is a market for bibles from domestic publishers that sells for $100-200 and is worth every penny. I’m just not seeing top quality coming out of the domestic publishers that we once had. Does anyone else miss seeing top quality bibles published here, or am I just a curmudgeon? 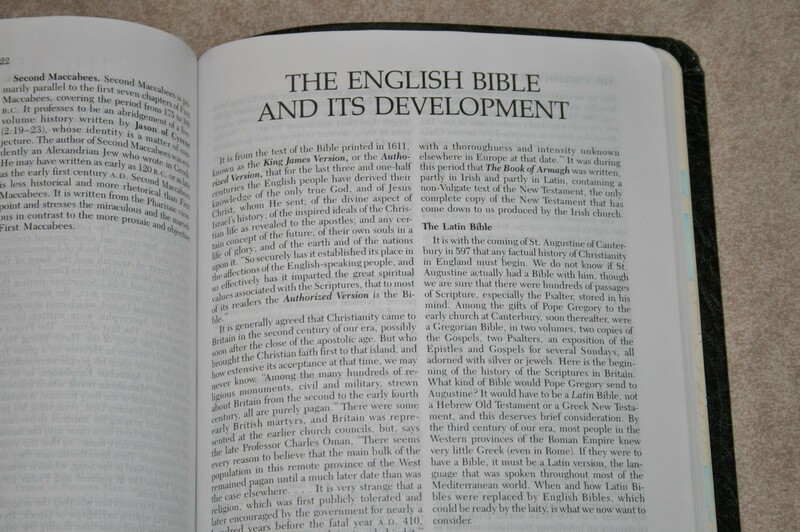 I would love to see US publishers produce the highest quality Bibles. Now it seems that anything over bonded leather is a luxury. I would gladly pay $200 for a quality Bible. I want to see quality come back and be the standard instead of the exception. I would like to see publishers raise the bar and set even higher standards. Good point Don, Nelson used to publish some beautiful Bibles. I have a few Open Bibles from the 80’s and all are smythe sewn w/ overcast stitching and great paper. Nelson also used to offer a nice Genuine Leather cover as far as pigskin goes. It probably doesn’t make economic sense to put the effort out for best quality. A further problem is that skilled labor is getting hard to find, and expensive as well rare. That bible I gave my son was purchased in the late 60’s perhaps as late as ’72. It was text only and definitly best quality workmanship and materials, I can’t remember the cost, only the wonderful quality. It pays to buy the best quality one can afford for anything worth buying at all. I recently spoke with a friend who works for Thomas Nelson in Nashville, asking why they no longer put out any higher quality bindings than what is available now. His response was they had done surveys and supposedly actually gave these people surveyed higher quality bindings to compare and supposedly there was not enough interest to justify it. I told him I found it hard to believe and I would love to know who was surveyed. The sad facts are that there are more and more who do not or cannot recognize good quality binding when they see it, if it looks good when they carry it to church, does not fall apart, and is otherwise useful, it is good enough for them. I’ve noticed this attitude towards craftsmanship not only in bibles but with other products as well, it is probably the reflection of the times we are living in. Hi guys. Yes I agree with all. 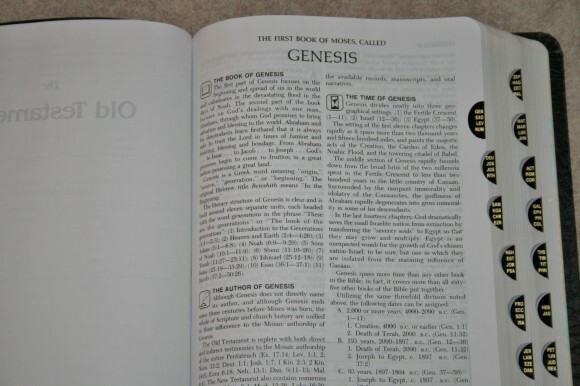 Bible quality has declined noticeably over the years. I first started collecting in 1977, when most searching was done via Bible catalogues, calls to distributors and visits to bookshops, There seems to be more choice today, but many aspects of production have been subjected to downsizing, even the typeset. The paper on some bibles is so delicate that tearing can occur unexpectedly. 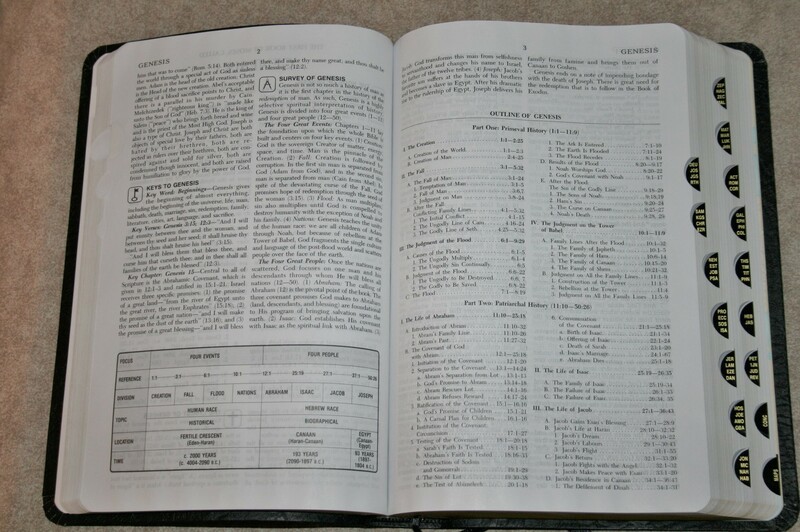 My second study bible was the original Open Bible in NASV with a beautiful dark font that just pulled you in like a magnet. Much applause to the publishers of the new 3 column Dake Bible – it seems to have GROWN in size, a rarity today. (Ive used the KJV Dake for 20 years and have found less than 1% of his exhaustive notes to be controversial). Randy, I thought your point on the route of the Exodus was excellent. When will publishers update this issue in their cartography depts?? Current evidence is compelling for a central route in 1446 BC across the Epyptian Peninsula, turning south to exit at the Nuweiba spit, crossing the middle of the Gulf of Aqaba, and straight into Midian to the Sinai valley where much archaeological evidence exists. Ive had to make my own maps because this annoying tradition still persists with publishers. Hoping they will change one day. Regards. Thanks Paul. Unfortunately, maps around the Exodus route seem to be getting worse instead of better. Those who used to show a possible crossing point around the peninsula have stopped and now many are showing a small loop in the north. Greetings, Randy, and belated thanks for your review. I’m here because an acquaintance and I were discussing Bibles, and he I asked me to have a look at his current favourite. It is “The King James Open Bible”, Nelson, 2010, bonded leather. The content seems to be the same as the one you reviewed; and I cannot readily see any differences from the internet-informed “Expanded” editions. I perused his Bible, and then I found your review. Like you, I think that the Biblical Cyclopedic Index seems to be its – very good – strength. While wondering how I might copy (but perhaps illegally?) the Index, it came to me to “google” : and, hey presto, I discovered that Nelson in 2010 published a stand-alone Index, costing less than £14/$20! isbn 9781418543747! This would be an ideal companion to a favourite AV(KJV) having 200,000 textual cross-references, etc. – and that would be our belovèd Trinitarian Bible Society’s Westminster Reference Bible! Do we need to add anything to the combination, do you think?